For 8 years as my husband’s caregiver, I continued to deepen my Svaroopa® Vidya practices. I continued to feel I was growing in my process. When he died last year, I thought I’d pick up where I’d left off as a householder. It had involved extensive socializing with friends as well as traveling. However, I realized it was an identity I no longer related to. I remembered Swamiji’s teachings. As old identities fell away, I didn’t want to construct another “small-s” identity. I sensed a powerful opportunity to see what lay beneath my personal stories. This process, however, was anything BUT blissful! I felt that I was stuck in darkness. I experienced a sense of nothingness. I still knew who I was in the deepest levels. Yet I couldn’t feel myself as Beingness. I had clarity of where I was. But I could feel only the contractions, the limitations that that bind us into time and space. They felt so heavy on the lightness that I knew myself to be. From Swami Nirmalananda’s deep teachings, I recognized what was going on for me. I was in fear of annihilation (anavamala). This is the all-too-human limitation that blocks our knowing of our own Self. Maya creates the swirl of the external world of objects and experiences (through Her kanchukas, Her powers), further covering that inner knowing. Anavamala drives us to construct identities for our small-s self. Resisting that urge, I was yet not able to experience my deeper Beingness. So, I reached out to my Guru. 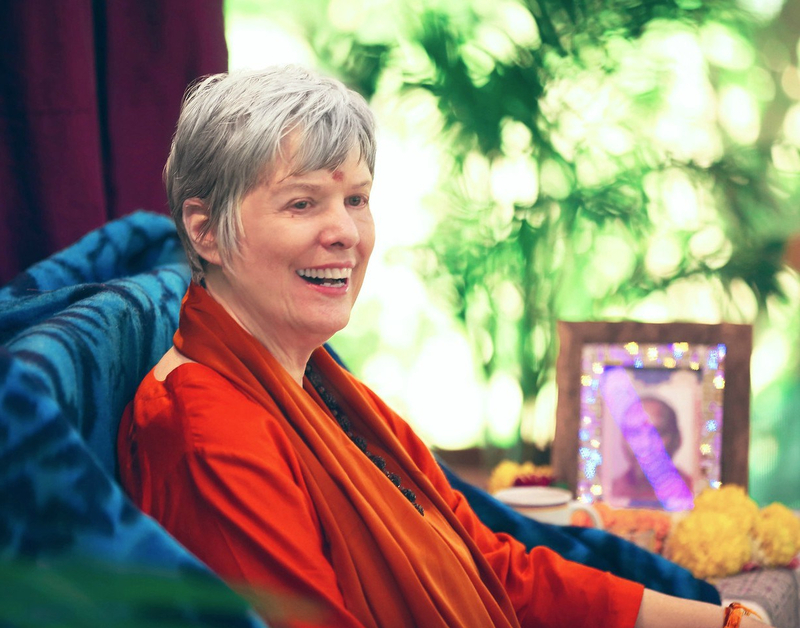 I signed up for the July Shaktipat Retreat with Swamiji. Everything changed. With Her, I am always on the path, embraced by Guru’s Grace. Within, I asked her to please make me fearless. With Shaktipat, my state shifted. I felt opened to new possibilities, to explore how to be joyfully and meaningfully alive, without the small-s identity. It feels like progress; the fog is lifting. My path is clearer, with Guru as my guide. I foresee new understandings forming. I am learning how I can express myself from the authentic place of my Self. To let go of constructed identifies, I am exploring their remnants. Meditating, japa and chanting Sri Guru Gita give me the lifeline for which I’ve been reaching. Remembering a profound experience from the July Shaktipat continues to propel me into knowing my own Self as the One Self Being All. I felt there was no barrier between my Guru’s heart and mine. Infinite heart space was encompassing us both. This entry was posted in Ashram News on August 28, 2018 by Svaroopa Vidya Ashram.